The 1960s was a time when the status quo was quickly becoming unacceptable, and change seemed inevitable. By 1963, more than 16,000 American soldiers were stationed in South Vietnam with an even larger presence in Korea. Americans had grown tired of foreign wars, and protests grew as the Draft grew into a large concern for young people. 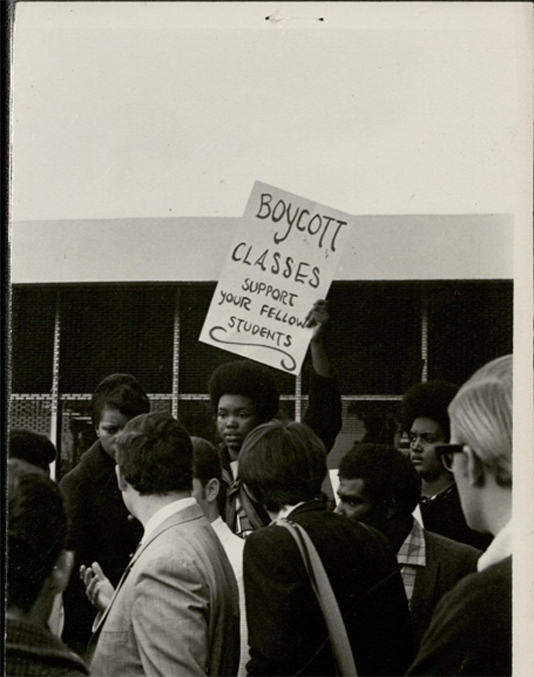 In the 1960s, CSUN, then called San Fernando Valley State College, reflected the restlessness of the community. 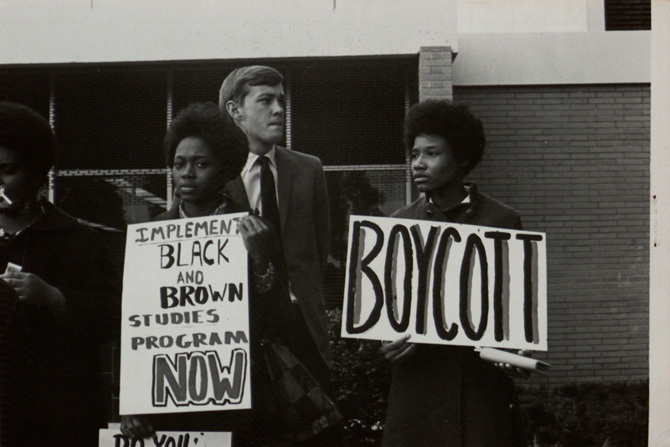 Over the course of the decade, the student population at Valley State became increasingly diverse, and students of differing ethnic backgrounds began to form groups and clubs on campus including the Black Student Union, United Mexican American Students, Movimiento Estudiantil Chicano de Aztlan (MEChA), and the Italian-Jewish Student Union. 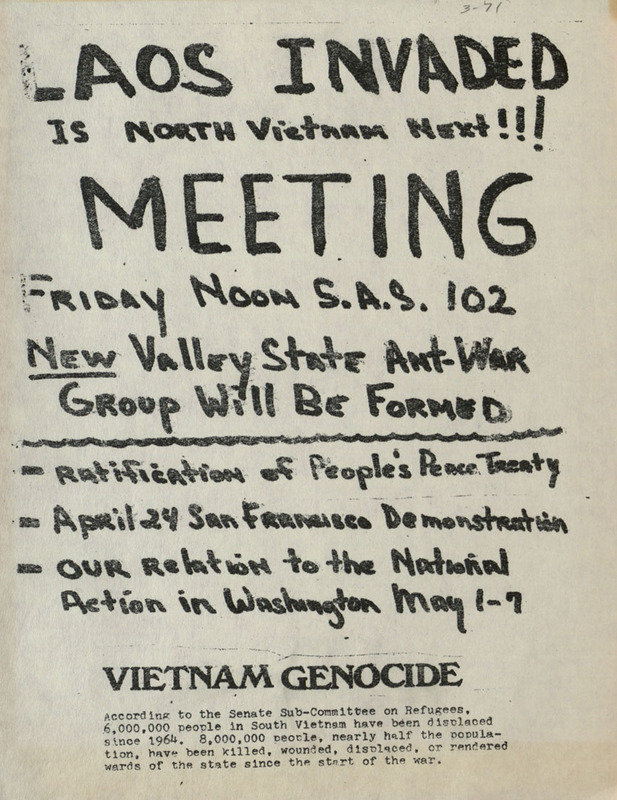 The SFVSC chapter of the Students for a Democratic Society (SDS) was also formed during this period. 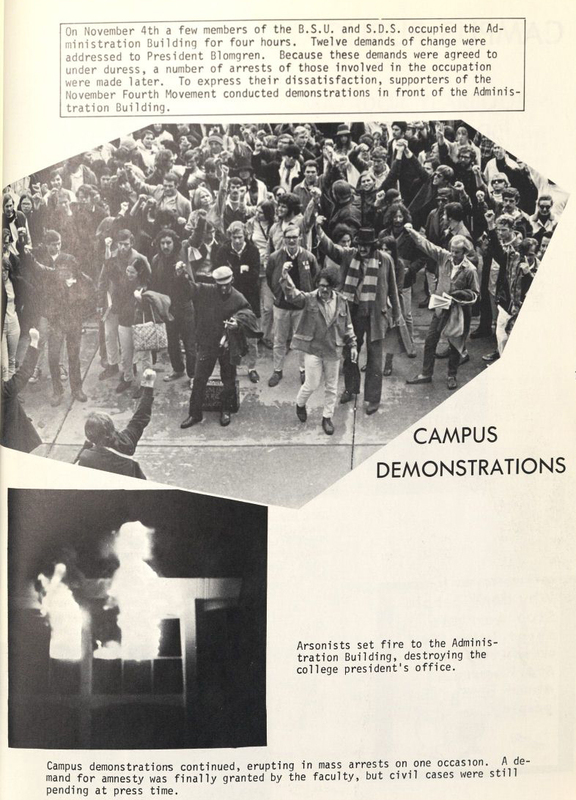 The Campus Unrest Court Transcripts Collection documents racial tensions which erupted with the take‑over of the Administration building, now Bayramian Hall, at Valley Sate on November 4, 1968. When Junior Varsity Football Coach Don Markham was accused off shoving an African-American student, the Black Student Union called for his dismissal. Two dozen black students were joined by SDS members as they marched to the Administration building to take up their grievances with Acting President Blomgren. In subsequent action, the students took over the fifth floor of the Administration Building. 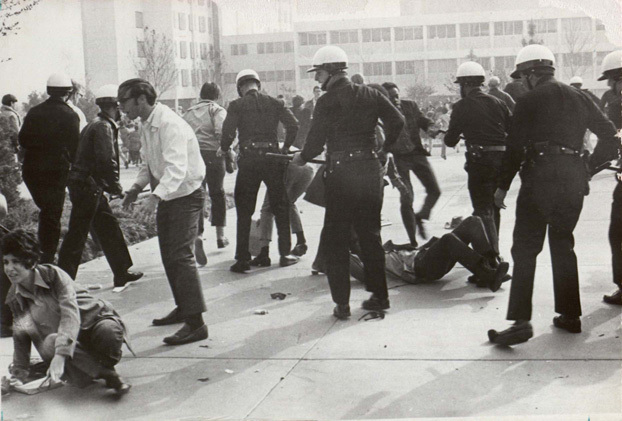 LAPD was called to campus and violence ensued, which resulted in twenty-four arrests. Ultimately, nineteen individuals were convicted, receiving prison terms between one and twenty-five years. The Dr. Richard Adcarian Campus Unrest Collection was donated by Abcarian, an English Professor at Valley State. 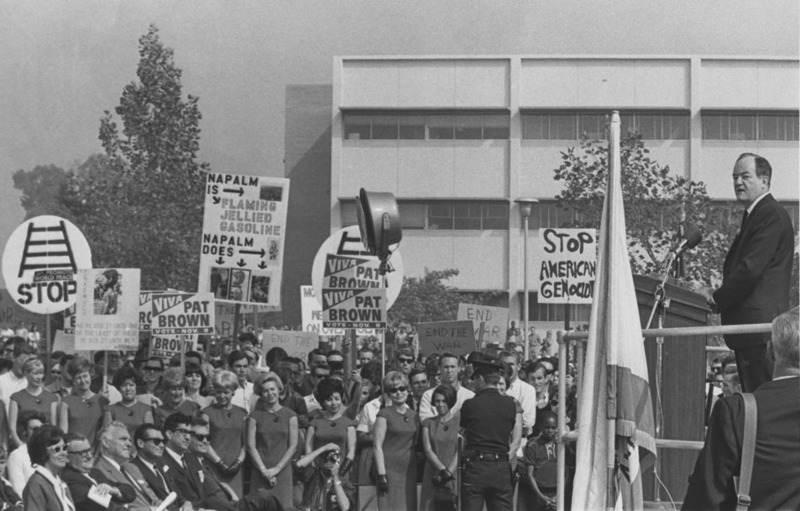 Dr. Abcarian took an active role throughout the last half of the 1960s, supporting several key protest movements that occurred on campus, including those against U.S. involvement in Vietnam and in favor of the establishment of the Chicano Studies and Pan African Studies departments at CSUN. The Campus Unrest papers of Dr. Abcarian contain administrative records, broadsides, correspondence, flyers, minutes, news clippings, news releases, photographs, and statements documenting the turmoil. Of particular interest are documents relating to the State of Emergency declared by acting president Delmar T. Oviatt on January 9, 1969. During this time all demonstrations, assemblies, and rallies were banned and demonstrators ended up serving jail time for violating the order. For an expanded explanation of protest movements, please stop by and view the current Tseng Gallery exhibit, "In Protest: The Shifting Paradigms of Collective Social Action."